Fruits de Mer Records (FdM) kick off 2013 by tackling The Hollies with a 16 song LP + 7″ vinyl package of contemporary bands doing covers of classic tracks by Manchester, England’s great 60s pop maestros. For those not in the know, FdM is a UK based label who specialize in vinyl only releases of current bands covering music, often quite obscure, from the 60s-early 70s, though the label also features some original music as well. 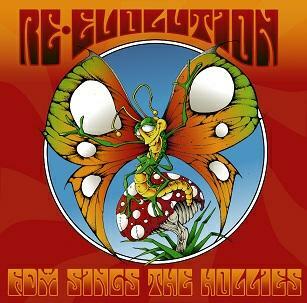 Re-Evolution: FdM Sings The Hollies is a tasty set and deserves a track-by-track overview. Beautify Junkyards, a Portuguese band who I was introduced to last year when they released a 7″ on FdM, do a gorgeous rendition of Butterfly with a spaced out medieval vibe. Atlanta, Georgia based The Seventh Ring Of Saturn do a beautifully executed cover of All The World Is Love, upping the psychedelic ante far beyond The Hollies original. I love that Eastern tinged vibe. Ditto for Nevada based musician Jay Tausig, who does an ultra-trippy and intense version of Elevated Observations. It’s got solid production and arrangements with killer guitar, sitar and effects. Between his FdM contributions and [almost] monthly The Trip Around The Sun series of albums, Jay was one of my big discoveries of 2012. From Bristol, UK, Hi-Fiction Science released an excellent album in 2011 and have made several contributions to FdM compilations. Their take on King Midas In Reverse starts off as a stripped down acoustic, sorta garage-tribal jam that gets more fleshed out as the song progresses, especially when the psych guitar leads and freaky electronic embellishments are added. The Re-Stoned are a Russian stoner rock band that I’m well familiar with from their three albums on the R.A.I.G. label, and pleasantly surprised to find doing a Hollies cover. Then The Heartaches Begin was a pretty psychy Hollies song with cool acidic guitar licks. The Re-Stoned quicken the pace and add female vocals, making it a rough and tumble fuzz-psych-pop rock ‘n roller, with a fantastic stoned rocking instrumental freakout break. Moonweevil, who I think might be a Cranium Pie side project, wrap up Side 1 of the LP with a wildly whacked rendition of Bus Stop, running it through an avant-spaced out electro-groove grinder. Adventurously off the beaten path this one is. Side 2 kicks off with The Gathering Grey doing an almost spot on cover of Postcard, though adding mellotron-ish sounding embellishments and other little effects, and I dig their trippy prog-psych instrumental finale. auralcandy are a UK based band I don’t think I’ve heard before, but I really like the way they add a soulful and slightly funky edge to Heading For A Fall. Hard Hard Year, as recorded by The Hollies, had a Beatles-esque You’ve Got To Hide Your Love Away feel to it. This was a good song choice for The Bevis Frond, as its ideal fodder for Nick Saloman’s acid-minstrel craftsmanship. Try It was one of The Hollies more tripped out, effects-laden psych songs, and the New York City based Sky Picnic are just the ones to take it even deeper into space. Theirs is a valium-paced cross between classic lysergic 60s psych and dronier Velvet Underground experimentations. The Neutron Drivers are a New Jersey based band I’d not heard before who do a relatively faithful cover of Water On The Brain, but their instrumental section goes way out into intense outer space. Very cool. Side 2 ends with Swedish duo Us and Them being the second band to take a whack at Butterfly, and really make the song their own with an acid/wryd-folk interpretation that will make you start thinking there should be a “Pagan-Prog” genre. I loved their songs from The Wicker Man 7″ on FdM a couple years ago. So that’s the LP, but we’ve got four more songs on the 7″ EP that comes with the package. King Penguin are from the New York City area and do a very interesting take on Dear Eloise. It starts off with a country-rock feel, then veers off into sitar and tabla driven Eastern influenced psychedelia, which I found to be a disorienting but very cool transition. The Higher State are another band I’d not heard before this compilation. Their cover of Don’t Run And Hide is one of the more spot-on covers of this set. Ditto for Scranton, PA based Langor’s rendition of Everything Is Sunshine. And UK based The Electric Stars are also mostly faithful to the original with their version of Jennifer Eccles, but do add some tasty guitar and effects embellishments. In summary, the bands on this compilation all do better than fine interpretations of their chosen Hollies songs, and not a few really took the music in a different direction, which always appeals to me. The album will be available in February and is limited to 800 copies, and as usual this is vinyl ONLY, no CDs or downloads. If interested you better hurry because Fruits de Mer releases have a tendency to sell out QUICK!